The petrochemical and chemical process industry utilizes a large number of high-temperature processes (up to 1200°F). This means that their plants must have piping and pressure vessel systems that can operate safely at these high temperatures. Since safety is a key issue in the industry, it is imperative to periodically inspect the piping and pressure vessel systems to verify that safe operational standards have been met. One inspection method often used is ultrasonics. However, conventional ultrasonics cannot be applied at these high temperatures, so the systems are usually shut down for inspection. The industry would like to be able to conduct inspections at high temperatures. A sensor technology called Electro-Magnetic Acoustic Transducers (EMATs) has the potential to insert ultrasonic waves into metal through electromagnetic coupling. This technology has had no proven track record even though a number of so called "fieldable" EMAT systems exist. The Materials Technology Institute (MTI) believed that EMAT technology has sufficient potential to justify an unbiased review of the state of the art to detect corrosion-type defects and wall thinning. Southwest Research Institute was funded by MTI to (1) contact a large number of EMAT vendors (total of 13), (2) develop a testing protocol, (3) develop test specimens for both ambient and high-temperature testing, (4) assist the various EMAT vendors in conducting the tests at SwRI, and (5) report the results. The purpose of this paper is to discuss the testing that was conducted, the results obtained, and summarize the present state of the art in EMAT technology in terms of ultrasonic thickness resolution, corrosion defect detection, and fieldability at high temperatures. The reliability of critical components in industrial plants directly and significantly affect the economic viability of the plant. Therefore, it is vital that the condition of critical process equipment be carefully monitored and controlled during operation to assure that forced, unscheduled outages are minimized or eliminated and scheduled maintenance outages are well planned and efficiently executed. One way the process industry can achieve these goals is to provide nondestructive evaluation (NDE) for detecting corrosion/erosion, hydrogen damage, and cracking on critical process equipment while the equipment is on line during regular plant operations. Ultrasonics has been used for detecting these types of defects for many years when the components are at or near ambient temperature. However, during regular plant operations, these critical components may reach temperatures as high as 1200°F. Conventional ultrasonic transducers cannot operate at these high temperatures for long periods of time since the piezoelectric crystals, in effect, depolarize and no longer produce mechanical oscillations at temperatures above the Curie temperature (for most piezoelectric materials, the Curie temperature is less than 700°F). Another approach for introducing ultrasonic energy into a part at high temperature is the use of electromagnetic acoustic transducers (EMATs). An EMAT generates ultrasonic energy in a conductive material in the following way. A magnetic field is set up in the part, and a high-frequency RF pulse is coupled into the part with a coil. The RF pulse interacts with the magnetic field to produce a mechanical force. This force produces mechanical waves at the RF frequency, which is usually in the ultrasonic range. This electromagnetic force can be applied to the part under inspection without using any liquid couplant; however, the coupling is dependent upon liftoff between the EMAT and the part, so it is important to keep the EMAT and part as close as possible (usually within 1 millimeter). Since EMATs can be used to introduce ultrasonic energy into the part without liquid coupling and direct contact with the part, they have great potential to allow ultrasonic inspection at temperatures above the Curie temperature. EMAT development has been under way for approximately 20 years, and their capabilities have been improving consistently. However, the capability of the present state of the art in EMAT technology for performing ultrasonic inspection at ambient and operating plant temperatures was not clearly understood. Materials Technology Institute (MTI) funded Southwest Research Institute (SwRI) to perform an unbiased evaluation of the present state of the art on EMAT technology for high-temperature NDE of remaining wall thickness. The project goal was to provide a standard set of test specimens, containing representative corrosion-like defects and remaining wall thicknesses, and have several EMAT vendors inspect them under controlled conditions so that a benchmark could be made on the state of the art. To accomplish this goal, SwRI (1) developed a test protocol, (2) designed and fabricated test specimens for use during EMAT evaluations, (3) designed and fabricated a high temperature test fixture, (4) conducted laboratory evaluations, and (5) assimilated the results. The work associated with each of these areas is described in the following sections. SwRI also communicated directly with each prospective EMAT contractor to (1) establish the goals of the evaluation, (2) develop contractual arrangements, (3) set up dates for their participation in the evaluation, (4) supply laboratory assistance as needed, (5) monitor the inspections, and (6) review the final results. The EMAT contractors who were contacted were Babcock and Wilcox (B&W); Quality Network on behalf of the Institute for Material Testing (IzfP); Welding Inspection Systems, Inc. (WIS); Industrial Sensors; Sonic Sensors; and Tecrad. Although all of these contractors established contracts with SwRI to participate in the MTI evaluation, only B&W, Quality Network, and WIS had participated by the July 31, 1996, deadline. Sonic Sensors and Tecrad were developing EMAT systems for the evaluation, but stated that they were not ready for the high-temperature testing at the present time. Industrial Sensors decided not to participate due to a heavy workload and no time to dedicate to the evaluation. To provide a totally unbiased review of EMAT capabilities, SwRI worked with MTI from the viewpoints of industrial application and the need to develop a test protocol that would provide information about the inspection sensitivities and effects of material and temperatures on the inspection capabilities. This protocol was also influenced by SwRI's understanding of the present state of the art of EMAT technology. The development of the test protocol, design of the test specimens and test fixtures, and basic ground rules for conducting the evaluations are discussed in Sections 2.1 through 2.4. The Test Protocol and Contractor Guidelines to the Test Protocol were developed with the intention of providing an objective evaluation of the state of the art of EMAT technology. The Test Protocol was prepared for limited distribution to representatives of SwRI and members of MTI's EMAT Resource Group, while the Contractor Guidelines to the Test Protocol was distributed to the EMAT contractors. The Test Protocol provided (1) the objective of the EMAT evaluation, (2) general testing rules to the vendors, (3) a description of the test specimens and the defects that each contained, (4) the temperatures at which each test specimen would be tested, and (5) the recording procedure. The Contractor Guidelines to the Test Protocol provided (1) a general discussion of the objective of the evaluation, (2) a general description of the test specimens, (3) testing rules, and (4) a discussion of the data recording and analysis procedures. To meet the goal of this project, test specimens were designed and fabricated. They provided corrosion-like defects and remaining wall thicknesses in the ranges expected in the industry. These specimens consisted of a 0.75-inch-thick A 36 carbon steel plate, a 0.75-inch-thick In600 plate, and a 0.5-inch-thick carbon steel plate. The types of defects contained in the test specimens consisted of round-bottom holes (RBHs) with diameters ranging from 0.125 to 1 inch and flat-bottom holes (FBHs) that were 1.5 inches in diameter. The RBHs had depths ranging from 0.25 to 0.65 inch and provided remaining wall thicknesses ranging from approximately 0.5 to 0.1 inch. The FBHs had depths ranging from 0.55 to 0.675 inch and provided remaining wall thicknesses ranging from 0.2 to 0.075 inch. Each specimen was inspected by SwRI using conventional 0-degree longitudinal wave ultrasonic inspection technology at ambient temperature as a control for the EMAT results. A 0.25-inch-diameter, 5-MHz, dual-delay line transducer was used with a Sonic Mark I as the ultrasonic instrument. The results obtained for each specimen are listed in Table 1. A practice block was designed and six were fabricated. A practice block was sent to each potential EMAT contractor prior to their evaluation at SwRI so that they could prepare for the evaluation. 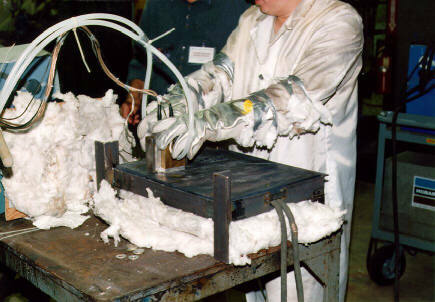 To conduct the evaluation at high temperatures, a test fixture was designed and fabricated that would allow the test specimen to be heated to and maintained at the proper temperature during the high-temperature test. Some of the EMAT contractors requested approval to conduct the high-temperature test with the specimens in the vertical orientation, while others preferred the horizontal orientation. The heating coils on the test fixture were controlled by a Reliant system that consisted of a TR800 Power Supply, TR600 DC Rectifier, SCD8000 Program Temperature Controller, and SCC75-3004 Contactor Box. The feedback loop was accomplished using a thermocouple placed in a hole in the side of the test specimen. Temperature crayons were used to touch the surface and verify that test temperatures (ranging from 700 to 1200°F in 100-degree increments) had been achieved and maintained. This fixture at high temperatures is shown in the horizontal and vertical orientations in Figures 1 and 2, respectively. The top and left edges of the test fixture were marked with the letters A through G and the numbers 1 through 9, respectively. This was to assist the teams in properly marking their results on the data sheets. The laboratory evaluations were set up to accommodate the three teams. The ambient tests were conducted in a laboratory setting, and the high-temperature tests were conducted in a welding shop. The teams were given data sheets for each test specimen prior to starting the tests. Each team was asked to mark the data sheets with the locations of each defect detected as well as provide the remaining wall thicknesses. Also, if the teams could provide an estimate of the defects' diameters, this information was to be illustrated on the data sheet. An example of a data sheet is shown for one specimen in Figure 3. The goal was to allow each team 2 days to set up their EMAT equipment and conduct the evaluation on three ambient-temperature plates and two high-temperature plates. The first day was to be used to set up the equipment and inspect the three test specimens at ambient temperature. The completed data sheets were given to the SwRI monitor by the following morning before the team could conduct the evaluation on the high-temperature test specimens. After completing all the evaluations, the data sheets for the high-temperature specimens were given to the SwRI monitor. After all the tests were completed, each team was debriefed regarding the defects in each test specimen. Of the EMAT contractors who did participate, the complexity and potential fieldability varied widely. One had numerous boxes, one had all the components in a single large box, and one had two boxes. All of them digitized data for later review. Two used manual scanning and had to record the data manually. One used a semimechanical scanning system and was able to construct C-scan images. Contractor No. 1 arrived on the morning of the first day expecting their equipment (shown in Figure 4) to be at SwRI. However, it did not arrive until approximately 2:00 p.m. They began unpacking and setting it up. 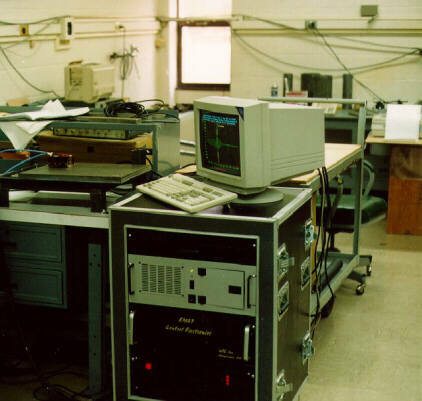 Their equipment consisted of the EMAT probe, pulser/receiver instrumentation, and a data processing unit. They began initial equipment testing but encountered many problems getting their equipment to function properly. They stopped at approximately6:45 p.m. and decided to begin again the following morning. On the second day, they encountered a number of problems. However, by 3:00 p.m. they had completed their initial equipment evaluation and calibration. After approximately 3 days of difficulties, they requested a second chance. SwRI agreed, since no information about the actual test specimens had been given to them. Approximately 3 weeks later, Contractor No. 1 returned to conduct their evaluations. During this evaluation, they had their equipment running within approximately 3 hours. They conducted tests on Specimens CS-1, CS-2, and CS-3 in 2 days. Contractor No. 2 set up their equipment (shown in Figure 5) within approximately 2-1/2 hours. The initial equipment evaluation and calibration were completed within approximately 1 hour. They completed tests on Specimens CS-1 and CS-3 within 3 days. Contractor No. 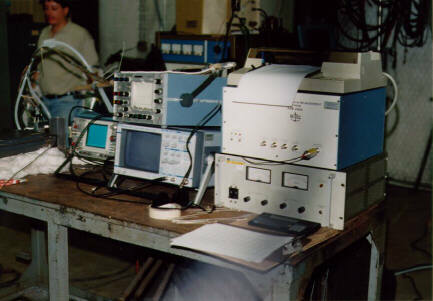 3 arrived around 4:00 p.m., unpacked their equipment, and completed their initial equipment setup by 5:30 p.m. Their equipment (shown in Figure 6) consisted of a manually operated scanner (with potentiometer position readout along one axis), the pulser/receiver instrument, and the EMAT probe. They conducted their calibration the next morning and were ready to begin the EMAT tests by 10:00 a.m. They completed data collection on Specimens CS-1, CS-2, and CS-3 within 2 days. This section provides a general discussion of the test results and data obtained by the teams for each test specimen. The results obtained by each team are summarized in Table 2. Contractor No. 1 detected a total of 18 defects, including 17 machined defects and one natural defect. They missed one 0.125-inch-diameter RBH (which had approximately 0.2 inch remaining wall thickness, located in E8 of the test specimen) and one natural defect (which was estimated to be about 0.125 inch in diameter and had a remaining wall thickness of approximately 0.4 inch, located in D8). The results for remaining wall thicknesses are also given. In cases where the remaining wall thicknesses were not determined, the notation Loss of BW (backwall) was used to notate defect detection and "no data" for remaining wall. The data showed that most of the remaining wall thickness values were within 1 to 20 percent. However, there were a number of remaining wall thickness errors that were much larger, i.e., 65 (D5) and 165 percent (D3). They also made a false call, i.e., they found a defect, shown in F4, where no defect was intentionally placed or found by conventional ultrasonics. Contractor No. 2 detected all 18 machined flaws. They did not detect the two naturally occurring flaws, but did have a questionable indication where one natural defect was located in D8. The error of the remaining wall thickness data ranged from 6 to 150 percent. They used a different ultrasonic wave mode to determine remaining wall thicknesses than the other two contractors. Contractor No. 3 detected all 18 machined flaws, but they did not detect the two naturally occurring flaws. They reported remaining wall thicknesses for eight defects. For these defects, the errors in the remaining wall thickness data were between 0.3 and 9 percent. Test specimen CS-2 was the same as CS-1, except that it was rotated 180 degrees, had the name tag located on the upper left side, and was tested at 800°F. Contractor No. 2 did not have EMAT equipment designed for the high-temperature tests. The actual inspection approaches used by the other two contractors at high temperatures were different. Contractor No. 1 positioned the test specimen horizontally and used water cooling. Contractor No. 3 positioned it in a vertical orientation and used air cooling. Both teams found the heat difficult to work around. The ground truth data for defect locations, approximate defect sizes, and remaining wall thicknesses for CS-2 are shown in Figure 8. The results obtained for Contractors No. 1 and No. 3 are summarized in Table 3. Contractor No. 3 detected all 18 machined flaws, but did not detect the two naturally occurring flaws. They reported remaining wall thicknesses for five defects, with an accuracy between 1 and 9 percent. Test specimen CS-3 was a 0.5-inch-thick A36 carbon steel plate, which contained 10 machined flaws. All three teams inspected this specimen at ambient temperature. A conventional ultrasonic inspection was also conducted. The results are summarized in Table 4. Contractor No. 1 detected all 10 flaws. This team reported remaining wall thickness data for 8 of the 10 flaws. Most of the errors in the remaining wall thickness data ranged from 2 to 18 percent; however, two defects had errors of approximately 60 percent. Contractor No. 2 detected all 10 flaws and reported remaining wall thickness data for all flaws. The errors in the remaining wall thickness data ranged from 0 to 300 percent. The explanation for the high degree of error was that they had not had a 0.5-inch-thick test plate with representative defects to practice on prior to testing. Contractor No. 3 detected all 10 flaws and reported remaining wall thickness data for only two of the flaws. The errors in the remaining wall thickness data were low, i.e., 0 and 5 percent. Test specimen IN-1, a 0.75-inch-thick In600 steel plate, contained 18 machined flaws. 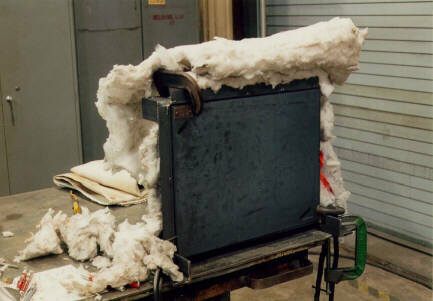 It was to be tested at ambient temperature. Test specimen IN-2 was the same as test specimen IN-1 except that it was rotated 180 degrees and was to be tested at 1200°F. However, none of the contrctors chose to inspect these specimens. The teams did remarkably well in flaw detection (for both ambient and high temperatures on the carbon steel test specimens). This is summarized in Table 5. Two of the defects that each team failed to detect were natural lamination flaws. Most of the remaining wall thickness data were within an accuracy of 20 percent or better. This was especially true for the ambient data. These data are summarized in Table 6. The ability to determine remaining wall thickness as a function of defect type (round-bottom or flat-bottom hole) and diameter of the hole is shown in Table 7. The effect of inspection at ambient or high temperature is also shown. Contractor No. 1 provided remaining wall thickness data for all defects that had a diameter greater than 0.125 inch (except one). This was true at both ambient and high temperature. Contractor No. 2 provided remaining wall thickness data for all the defects at ambient temperature only. Contractor No. 3 provided remaining wall thickness data for defects greater than 0.5 inch in diameter. EMAT technology has been shown to provide good defect detection and remaining wall thickness data on carbon steel material ranging from 0.5 to 0.75 inch thick at ambient and high temperatures (800°F). This capability compares well with ambient inspections using conventional ultrasonics. The fieldability of the EMAT systems varied widely. Only one EMAT system had sufficient engineering to make it into a conveniently fieldable unit, while the others had different levels of potential fieldability. Further work is needed for use in the field. The ability to conduct high-temperature testing varied widely. Only two of the EMAT systems evaluated had transducers that could withstand the high temperatures. These transducers had cooling water or air, and one contained thermocouples to warn of possible sensor overheating. 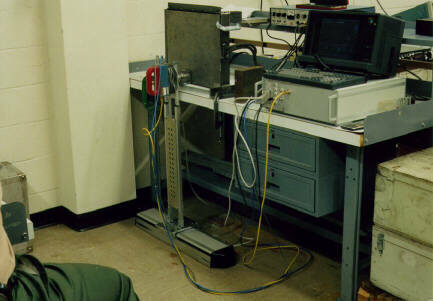 Since no EMAT contractor inspected the In600 specimens (even though they were told that these specimens would be in the test and several contractors were sent practice test pieces), it must be concluded that the paramagnetic properties of that material significantly reduced the capability to perform an EMAT inspection. State-of-the-art EMAT technology in this evaluation illustrated 90-percent detection capability at ambient temperature and 80 percent or better at 800°F; therefore, it is believed that EMAT technology is ready for limited field trials. Unitize and integrate all needed hardware into one or two small boxes so that the system can be easily fieldable. Improve the EMAT sensor head for operating at high temperatures. Conduct limited field trials of EMAT to demonstrate its capabilities. Once this has been completed, another state-of-the-art evaluation should be conducted. The objectives of the EMAT evaluation project could not have been accomplished without the help of the EMAT contractors. Since the contractors did not receive any direct compensation for their participation, SwRI and MTI would like to thank them for their efforts. Contractors and personnel who participated in the evaluation were as follows. Babcock and Wilcox was represented by Dan MacLauchlan and Charles Overby. Quality Network was represented by Mike Dalichow and Joel Harrison (with Raytheon). Weld Inspections System, Inc., was represented by Paul Davidson and Mark Adams (of Quality NDT). of the Chemical Process Industries, Inc.